After all is said and done, you were left with a scar that looked a little bit different than the other skin around it. This is due to the fact that scar tissue forms in a different pattern than the rest of our skin in order to provide maximum protection. It’s our body’s way of keeping us safe. While the bike scar is an example of a visible wound, we can also develop scar tissue internally. When a rotator cuff is torn, or a Cesarean Section is performed, scar tissue develops in the surrounding muscle as it heals. Although we can’t physically see the scarring, it can still have some negative effects that need to be addressed. These “war wounds” on your body whether visible or not have a profound effect on how we move and how we feel. That’s because our body works in a system of connective tissue called fascia, muscles, and bones. If one area of our body is affected, another group of muscles work harder to compensate. A lot of health issues – both physical and mental can be traced back to our scars too. One of my patients casually mentioned that she still had abdominal pain after a Caesarean Section birth many years ago. “It just feels kind of numb but also like something is pulling in my lower abs” she told to me. She went on to explain that she still had discomfort when she bent forward to pick something off the floor. I explained to her that when the incision was made during her surgery, they would have cut through her muscles and even nerves, thus causing the numbness. This means scar tissue would form around the incision to protect her but it was also one of the biggest factors limiting her range of motion and causing her pain. And in addition to this, her muscles couldn’t work properly because they were “wounded”. After some discussion, my patient agreed to let me start to work on her scar tissue. I’m happy to report that her pain has significantly decreased, which has lifted her mood, and she’s even noticing the scar itself is less visible too. Why you’ve gotta break up with your scar tissue – even though it’ll be hard! Did you know there are 19 different ways to break up scar tissue?! You read that correctly… NINETEEN DIFFERENT TECHNIQUES!! And I recently had the pleasure of learning many of these from one of the best minds in the industry and I’m so excited to share a little more of what I learned with you. Sharon Wheeler is a brilliant educator in Fascial Work for Scars, Bones and the Cranium. She teaches bodyworkers like myself techniques to improve their own methods in treating their patients. I spent my time with Sharon learning specifically about scar tissue and the benefits of Scar Tissue Therapy. Now while this all sounds rather amazing, there are a couple of things to consider before you get started on Scar Tissue Therapy. 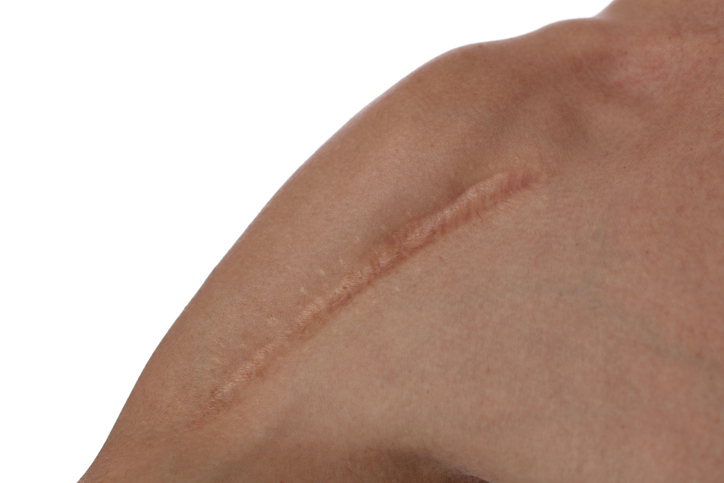 It’s important that your scar has fully healed before you start any treatment whatsoever. Check with a qualified Healthcare Practitioner before starting this type of protocol. It’s also important to note that the treatment length varies from patient to patient. Several factors affect the severity of your scar tissue. That all being said, I am confident in the resiliency of the human body and know that with time we can all bounce back from our scars – visible, and non-visible alike. Ready to put the fight back into your “war wounds”? Let’s discuss whether Scar Tissue Therapy may be right for you.